Do you already have the craft bits out? Then Why not have a go with this little game from our PlayMama App – this version for 2-23 month old’s! The App has over 90 games which each track the skills your baby develops.. helping you spend quality bonding time with your little one whilst their skills develop! 3. 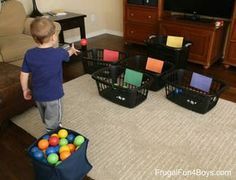 Now talking about helping their skills, why not try a toilet toll game to help their fine motor skills like this and to learn colours?! 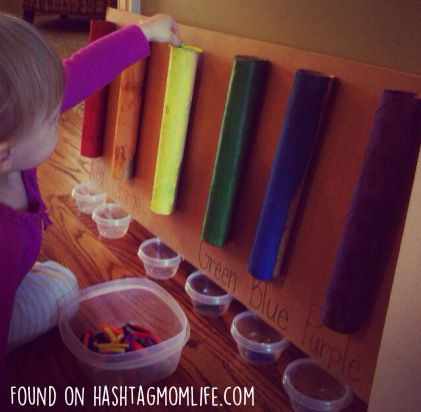 It’ a genius idea and this one we love by Hash Tag Mom Life! This one may keep them busy for a while, a perfect excuse to fit in a quick 5 min FitMama exercise whilst you watch your little one! 5. Octopus! Why not make a seaside on the table?! An exciting and easy Toilet Roll Kids Crafts – make fish with shiny scales and make the centerpiece of their sea a great colourful octopus! 6. A great way to help the kids remember how important it is to tell the time (get them used to routine) and to enjoy being proud of their very own handmade watch! Red Ted Art’s version below is just perfect – all you need is some colouring pens, paper, sellotape and scissors! Even the White Rabbit from Alice in Wonderland would approve of these creations! 7. Toilet Roll Butterflies have to be one of the easiest and most enjoyable crafts to make for both boys and girls, let them draw or paint on the wings whatever their imagination produces and send them off to run around the garden enjoying their new butterflies! Thanks Pre School Activities US! 8. Like our Awesome Autumn game in PlayMama, if you have a day out planned with your little kiddies first, take a bag with you and some gloves (spare marigolds are fun!) and let your child pick up nature bits like leaves and conkers along the way! Encourage them to say the colours, count, be observant, and really uses all their 5 senses and attention skills! Get home empty your bag and make your woodland people just like the lovely Crafts by Amanda has done here! 9. If they children are in the garden or you are planning a kids trip to the park why not make these fabulous binoculars first, then they are all set to explore the trees for squirrels and the sky for birds (lets hope less of the muddy ground for worms….!) Try these by Cupcakes for Clara! 10. Ok so lastly, how about something that you can do together AND benefits your garden….?! Who would have thought bird feeders could be made like this! Thanks to DIYReady.com We have a great and easy version for Mum to make with the kids! Ready to tidy up? What a day! Well how about this – get your little one to help you tidy by learning with a game at the same time! Not only helping their routine, but this PlayMama App game also helps develop their attention, memory and co-ordination! Free to download too! For more craft inspiration for your little one’s, look no further than our Pinterest board with a HUGE variety of ideas for baby learning games to tasty recipes! Or for a quick post-pregnancy or general shape up at your own pace in your own home, try FitMama! And for those days you are just too tired or need a boost of creativity, use PlayMama to enhance bonding time with your aby and track the 7 key skills important for their first 2 years. BeHappyMum. Making Realistic Apps for Busy Mothers!